Great detailed instructions to weld like a pro! Covers all popular types of welding, from oxyacetylene welding and cutting to arc, MIG, TIG, and plasma-arc welding and cutting. 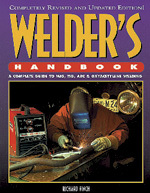 Gives tips on building simple or complex welding jigs and fixtures. How to weld everything from mild steel to chrome moly to aluminum, magnesium and titanium. 160 pages, over 400 illustrations.